Thai-Burma border-based health organizations, local health experts and health experts from overseas, and leaders of ethnic health organizations participated in a health seminar at the Thai-Burma border on May 21-22. The Burma Medical Association (BMA)’s director Saw Nay Htoo, who led the seminar, said the seminar was held to collectively find ways for the emergence of universal health coverage and decentralized health system. “How can we find the solution to achieve a decentralized health system, which is wanted by ethnic groups, from universal health coverage? Can we get it? If so, what are the ways to achieve it? We are finding the solution together,” he told Karen News. The first day of the two-day seminar focused on cooperation for social responsibility, methods for collecting health expenses, and cooperation between the authorities and the private sector on the health system based on accountability and responsibility. Methods for the decentralization of the health system were discussed on the second day. 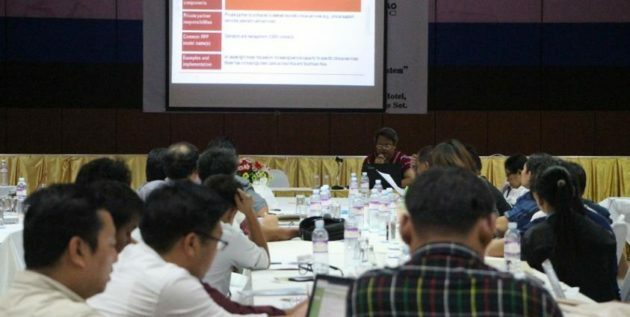 Over 50 people including representatives of the Back Pack Health Worker Team (BPHWT), the Burma Medical Association (BMA), Mae Tao Clinic (MTC), and the Karen Department of Health and Welfare, ethnic health representatives, and experts attended the seminar.